A painting claimed to be a previously unknown portrait of the three Bronte sisters has sold for more than £40,000 at auction. The watercolour, attributed to Queen Victoria's favourite artist Sir Edwin Landseer, was sold by JP Humbert of Whittlebury, Northamptonshire. The painting has attracted both firm supporters and those who doubt whether it does depict the Brontes. It was sold to a collector who plans to do more research and resell it. Bidding took off just 15 minutes before the end of the "timed" online auction with the painting sold for £40,550 hammer price (£50,038 including buyers premium) to an private investor believed to be based in the UK. Auctioneer Jonathan Humbert said: "We are very pleased our theory has been accepted and endorsed by the establishment. 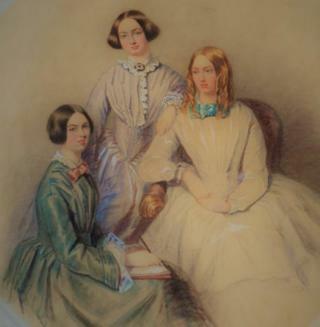 "The evidence was compelling that this is the Brontes as painted by Landseer and its successful sale has proved that research and factual evidence will overcome apathy and negativity." Mr Humbert had decided to pull the picture, which he believes to be of "national importance", from an auction in 2012 so more research could be done. Landseer was a popular Victorian painter best known for his animal portraits and designing the bronze lions in London's Trafalgar Square.